Administering and configuring a WAN has often been an error-prone, costly and ultimately time-consuming endeavor. More specifically, teams sometimes end up having to manage each WAN site individually, a slow process that also creates a lot of risk whenever two sides of a link do not match up. Plus, failed links, high latency and jitter become particularly problematic because a traditional WAN might lack the path analysis and routing intelligence needed to ensure sufficient bandwidth for critical business applications. This absence of network-wide configuration and smart monitoring has meant that increasingly central applications, such as VoIP and video conferencing, are often at an unacceptably high risk of having their performance compromised. The 2014 State of the WAN Report from Ashton, Metzler & Associates underscored the concern here, finding that the top two factors that survey respondents expected to drive their WANs over the next 12 months were improving application performance (cited by 42 percent) and supporting real-time applications (32.4 percent). How can IT realize these goals and regain control of their WANs? Talari Aware is a centralized management system for a Talari-enabled WAN. It provides a rich set of options for configuring, monitoring and analyzing the WAN, allowing for excellent visibility into potential performance issues and overall network health, as well as tight enforcement of service level agreements with carriers. IT gets broad insight into the network, while CIOs get data that helps them measure the cost-effectiveness of SLAs such as contracts for MPLS. How bandwidth is used across each and every Internet or MPLS link, which helps with overall capacity planning and enables additional bandwidth to be directed to saturated links as needed. Comparisons of performance of MPLS and Internet links, with the ability to see, by way of time correlation, whether MPLS is less or more reliable than broadband over the long term and how cost-effective it really is. Custom dashboards, reports and maps created from aggregated data from multiple machines (which is very difficult to do with legacy setups), with many options for visualization and review of information from different perspectives. Breakdowns of latency, jitter and traffic for all existing connections, so that IT can discover any issues deep within the network and adjust accordingly. Any unknown applications or consistently poor-performing links that network planners should know about and work around through the selection of alternative service providers. 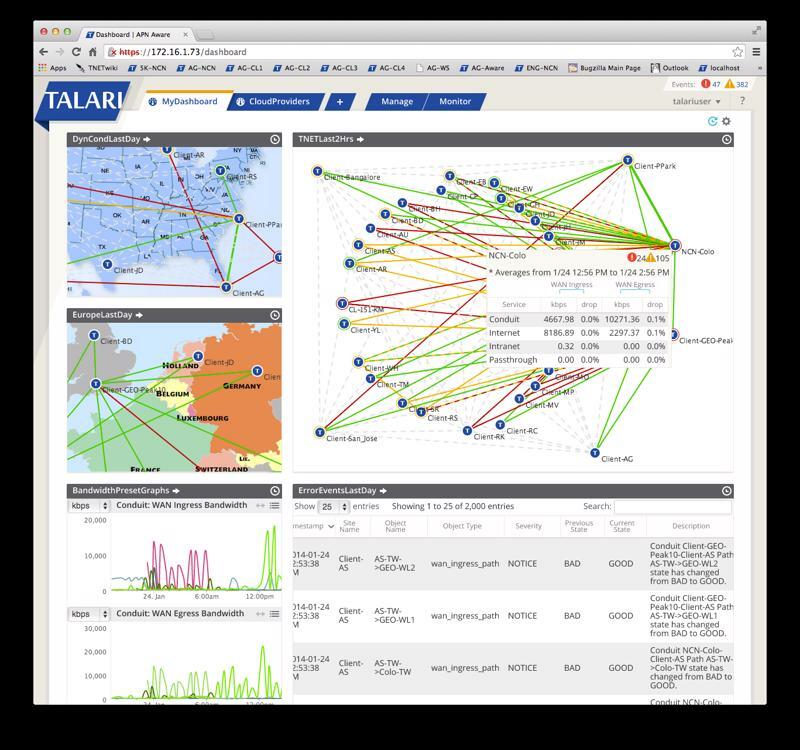 With Talari Aware, IT gets essentially a specialized search engine for its enterprise WAN. That is, statistics and trends can be easily looked up and reviewed as text or in a dashboard or map. A centralized database collects information from each appliance and offers a time correlated view into the state of the WAN for devices spanning multiple time zones providing around-the-clock visibility. How much bandwidth does your business really need to function? Can your WAN sustain voice traffic without dropping calls? These questions are hard to answer without the insight of a smart platform like Talari Aware that centralizes and streamlines WAN management. To these ends, Talari Aware implements a database at each network appliance to harvest the information by requesting a snapshot of the data as rapidly as every 2 minutes. It uses very little bandwidth itself during this process, but allows you to drill down and see who or what may be using the most bandwidth on the network and whether that usage can be optimized. Talari Aware also ensures that mission-critical applications get the bandwidth and optimal paths that they require, even during link degradation or in failover situations. It can tag and measure every packet to determine what the WAN can and cannot sustain. Internet and intranet traffic and MPLS and Internet links can all be analyzed to get a clear sense of how bandwidth is being utilized across the WAN. Information transfers at any site are detected and recorded by Talari Aware in real time, and it can figure out what is talking to what at any given time. As a result, the help desk can identify and address problems before anyone even calls them in. “Talari monitors circuits to an exquisite level.” Scott Steinke, Network and Security Engineer, The Hain Celestial Group. Talari Aware is a plug-and-play, click-and-change solution that is easy to use. Moreover, it saves IT a lot of time that would otherwise be spent going to every site on the network, collecting information and then entering it all into a manual table for correlation. The Talari Aware configuration module is a more streamlined alternative to traditional site-by-site network management. Its intuitive design is the same as the on-appliance Web interface and it can quickly provision sites either with help from network maps or in a tree view. Configuration of the WAN for your company’s specific requirements is further simplified through Talari Aware’s many audit checks and its default values and rules. The variety of visualization options in Talari Aware, from text reports to zoomable network graphs, make life simpler for IT as it makes sense of the vast amount and range of data that it handles. At the end of the day, Talari Aware helps you stay on top of network quality and application performance so that your organization can get the most out of its Talari-enabled WAN. Request a demo of Talari to learn more.